– The recipe calls for packaged tortellini, but it’s fabulous with homemade goat cheese & herb ravioli. And real garlic of course. When I was growing up, every weekend my dad would make breakfast. The repertoire was limited but satisfying: pancakes, waffles, French toast (occasionally), or biscuits. I recall liking all of them (as I still do) and a cooked breakfast always feels like a decadent affair after a week’s worth of cheerios-and-milk, granola and yogurt, or toast with cream cheese and honey. So, with a bottle of creamy buttermilk in the refrigerator, I decided it was time to work on my biscuit craft. This weekend, to start with, I pulled out “The Joy of Cooking”, because the recipe was guaranteed not just to be there, but to be simple as well. And it was certainly easy. I decided to make monstrous, restaurant-size versions, and within thirty minutes I had these piping hot fluffy biscuits (pictured above) on the table. To go along with them, I whipped up a simple sausage gravy (cook meat, add flour to create a roux, add milk or cream, cook until thick, season). 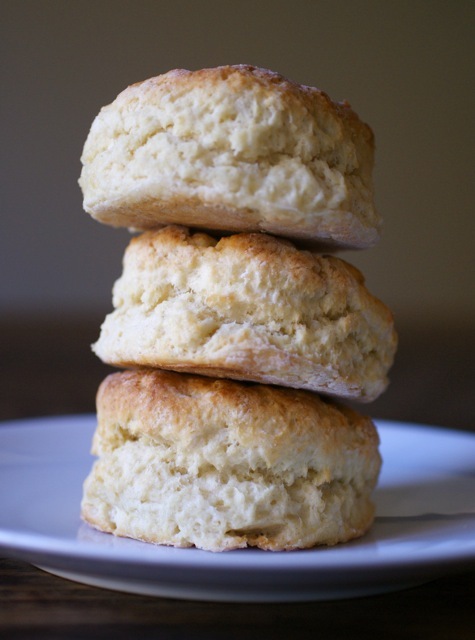 They were delicious with the gravy or with some honey, but I have to admit, a hot biscuit with butter and a little jam can be deeply satisfying. In fact, that was the best of all – just like dad used to make. Mix dry ingredients. Cut in butter. Add buttermilk and stir until dough just holds together. Transfer to a floured surface, gather dough, and flatten to desired thickness. Cut out circles (I used a glass). Bake at 450°F for 10-12 minutes. Cool on wire rack. Note: Keep the fatty ingredients cold and don’t work the dough too much. You can brush the tops with milk, cream, or melted butter prior to baking for a nice finish. I’m looking forward to experimenting with these in the future, playing with the recipe to adjust the sugar or salt or to incorporate lard, for example. Boasting gorgeous mountain scenery, a beautiful college campus, distinguished history, and a wonderful small-town feel, Charlottesville (VA) is a great vacation destination. 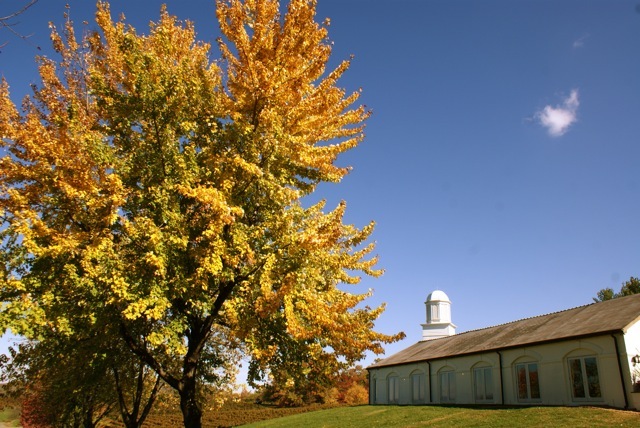 The home to the University of Virginia and Thomas Jefferson’s Monticello is situated near the blue-ridge parkway, and is a short 3-4 hour drive from the Triangle. It makes for a fabulous weekend getaway, especially at this time of year. The ride up is lovely, passing through Danville and Lynchburg and by countless weathered barns and a handful of road-side antique shops where you can spend hours combing through mountains of junk, or gems, depending on your disposition and luck. My wife and I recently went for a short weekend jaunt, with one of our goals being to explore the city’s great foodie/locavore culture. Our first meal was lunch at Feast!, a gourmet grocery in the city’s awesome Main St. Market. Home to an organic butcher, a florist, a seafood vendor, an excellent bakery, a cooking supply store, and a restaurant or two (in addition to the gourmet grocery), the market is a true foodie mecca, the likes of which would be a perfect addition to the Triangle culinary scene (Raleigh in particular). Sure, we have a Southern Season, but the neighborhood feel of Charlottesville’s Market, combined with the florist, butcher, and bakery, set it apart as someplace you’d want to go all the time. Feast! is like a tiny, fancier Whole Foods, with prices to match. A small 3oz (?) tub of local pumpkin chevre (incredible, by the way) set us back over $7. It’s little café serves up fantastic sandwiches and sides: my wife tried a turkey, cheddar, and fig chutney on ciabatta, and I had the local prosciutto, tomato, mozzarella, and basil on a beautiful baguette. A small cup of butternut squash-lentil soup was equally as satisfying. Later that afternoon, we headed to the Vintage Virginia apple festival, about 15 miles outside of town. Here I tried Winesap, Gold Rush, Pippin, Rome, and many other varieties of the delicious fruit, and came away with a few pounds worth for home. The highlight of this adventure, though, was the apple cider donut from the Carpe Donut truck. Warm, fluffy, and not overly sweet, it was certainly one of the best donuts I’ve ever had. Dinner that night was terrific as well. The Local, as the name implies, serves up a delightful modern menu of pastas and mains prepared with regional ingredients (witness the “60 mile salad”, in which all components are sourced from within that radius). Tucked away in a residential neighborhood, it’s a small restaurant with lots of charm. To begin with, we were served perfect crusty baguette slices with herb butter. My wife and I both opted for the chicken dish – stuffed with goat cheese and VA country ham, and served with some sort of brandy-apple-cream sauce over a roasted potato medley. Although the chicken was a bit overcooked and the potatoes were truly miniscule, the creamy sauce was sensational and the price ($15) was great considering the quality of ingredients used. I thought asparagus was an odd choice for a seasonal vegetable accompaniment, but I didn’t ask about it. The next day, we met friends for a late brunch at L’Etoile. This restaurant is located on two floors of a small, cute downtown building. The effect is residential, French, and seductive. For lack of a better description, it is ridiculously charming. Despite the Frenchiness, the brunch menu features the staples of upscale Southern American brunches: biscuits, shrimp and grits, eggs, and so on. I opted for the “3 star breakfast” which included a biscuit with sausage gravy (very nice), scrambled eggs (good), bacon (poor), and hash browns (worse). My wife had a hollandaise-english muffin kind of thing, which featured some very runny eggs. The shrimp and grits looked nice but the portion size was tiny. And a chicken salad sandwich looked very average. We all loved the space, but the meal was a bit disappointing. On top of that, the service, including the hostess, was best described as bewildered. I’d try somewhere else next time. Before heading out of town, we picked up dinner (for the road) at the Greenwood Grocery and Gourmet Market, about 10 miles west of town. The place was like a country store/Feast! hybrid, with all manner of local groceries and a little counter serving prepared foods. Unfortunately, being Sunday evening, the sandwiches were not available, though they sounded oh-so tempting (think house made local beef meatballs with homemade marinara and provolone on ciabatta). We ended up with some curry chicken salad (good but underseasoned), a loaf of local sourdough (excellent), and some regional potato chips and root beers (respectable). As we ate in the car on the way home, passing right by McDonalds and Wendy’s, we thought: when are we coming back? 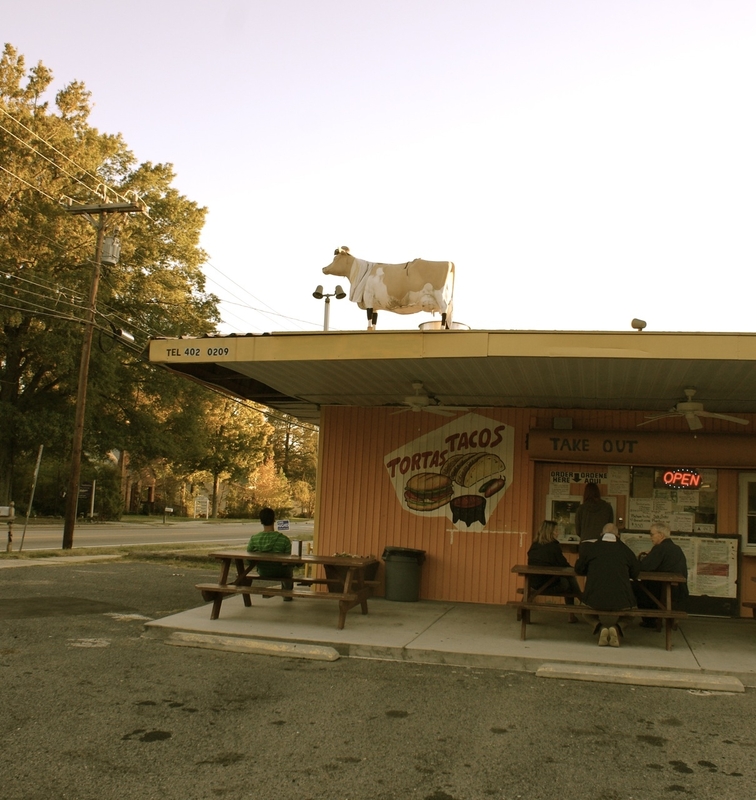 It makes for an odd site – a little shack with crude images of “tacos” and “tortas” painted on the side, a large cow (with bandaged ankles) standing on the roof – directly across the street from Four Square restaurant, one of the Triangle’s finest dining establishments. But Durham’s Taqueria La Vaquita is easily one of my favorite Mexican food places in the entire Triangle. You place your order at a small window that is much too low for comfortable conversation and then wait for your food at one of the picnic tables strewn about. But pay no heed to the distinct lack of charming ambience, or the lengthy wait while your food is prepared. One of the best things to order are the enchiladas. Priced at around $9-11, you get four small enchiladas with rice and delicious beans, and it’s just about enough to feed two. The enchiladas poblanos are exceptional, with a phenomenal mole sauce that is hands-down better than that from the Fiesta Grill, another popular local Mexican joint. Or try the equally exquisite enchiladas rancheras or verde. All incorporate the restaurant’s excellent house-made corn tortillas. In colder weather, do not pass up the absolutely divine Mexican hot chocolate. La Vaquita boasts an extensive menu, and I look forward to sampling much more of it. If only I lived closer. 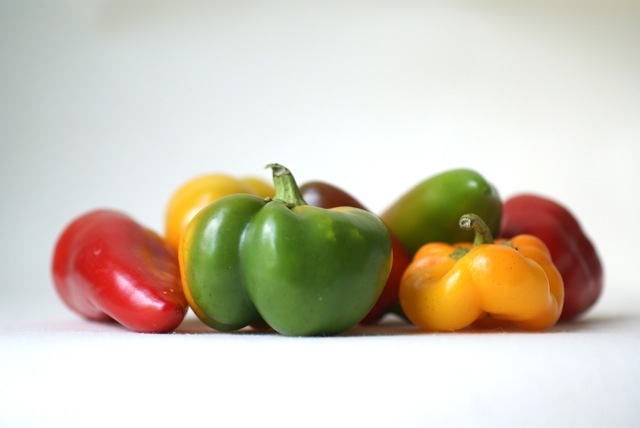 The third annual Pittsboro Pepper Festival is coming up this Sunday October 3rd from 4-7pm. The event will benefit the Abundance Foundation and the Piedmont Biofarm. The Abundance Foundation is focused on both renewable energy and local food, and has been supporting Farmer Doug Jones’s research at Piedmont Biofarm for many years. There will be a pepper tasting of 40 different varieties of mostly sweet and some hot. 12 Local Chefs from the Triangle and Triad will be creating dishes using Farmer Doug’s peppers, including chefs from 18 Seaboard, Angelina’s Kitchen, Carolina Crossroads Restaurant, Chatham Marketplace, Chipotle, Crook’s Corner, General Store Café, Lucky 32, Market Restaurant, Mez, The Natural Chef Program @ CCCC and Zely & Ritz. In addition, Triangle Brewery will offer a habanero pale ale beer. There will also be live music by the Holy Ghost Tent Revival and a tour of the Eco-Industrial Park on Lorax Lane. The Park is home to Piedmont Biofarm, Piedmont Biofuels, The Abundance Foundation, Eastern Carolina Organics, Carolina Worm Castings, Green Door Design Build, Green Bean Counter, EcoBlend, Roundtable on Sustainable Biofuels, Working Films and Screech Owl Greenhouses. Tickets are $15 in advance and $25 at the door, with children 12 and under free. For more information and to purchase tickets, please see the event webite here. The title of this entry, posted as a Facebook update, elicited a response of “I refuse to believe that’s possible”. But it is possible, even easy, and the results are delicious. First, let’s call the graham cracker (and it’s cousin, the animal cracker) what it really is: a cookie. 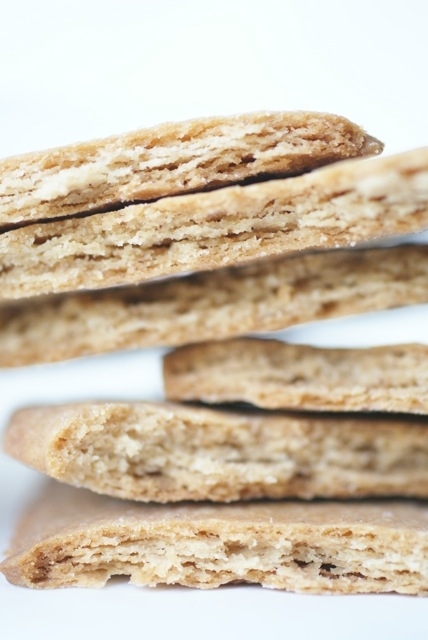 The fact that graham crackers derive their distinctive texture in part from whole wheat flour does not make them a health food. And, as you’ll see from the ingredient list below, neither do the substantial amounts of fat (butter) and sugar. But, like most any homemade food, these graham crackers don’t contain those mysterious (and nearly ubiquitous) industrial ingredients like partially hydrogenated oil, high fructose corn syrup, “artificial flavor”, and soy lecithin. Instead, what we get is a simple shortbread, which, even if it doesn’t quite have that familiar crumbly texture, tastes oh so much better. The recipe here is from The Craft of Baking. Growing herbs is one of the simplest and best ways to improve your home cooking, practice sustainable eating habits, and save money at the same time. We grow [pictured, from left to right] rosemary, mint, chives, basil, thyme, sage, and [not pictured] cilantro and oregano. At one point we had some dill and parsley going too. 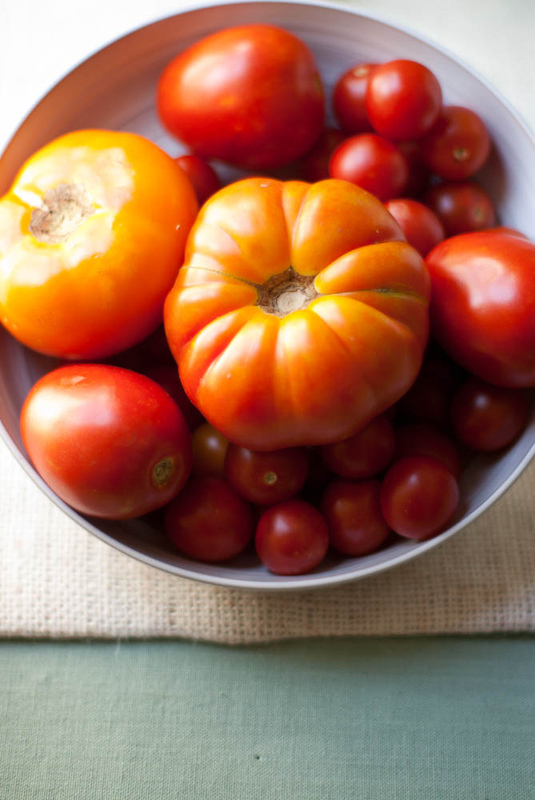 We use these in countless dishes on an almost daily basis. 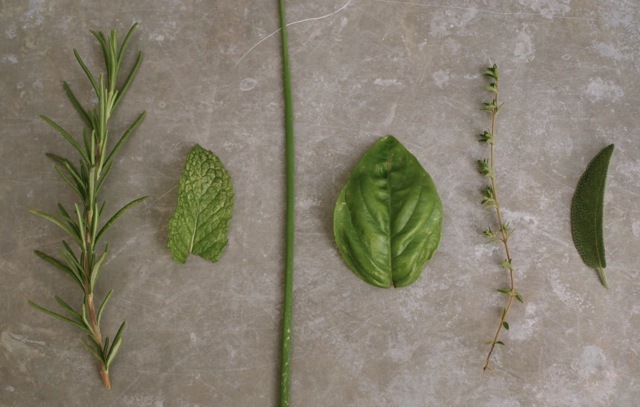 The use of fresh herbs brightens the taste of almost any dish, from savory to sweet to salads. And, by growing your own, you simply pick only what you need. It’s easier and more economical than dealing with the rest of that huge bunch of grocery-store cilantro after you’ve used a handful in some guacamole. Growing herbs doesn’t require much outdoor space; you can even grow them in pots. So go for it!